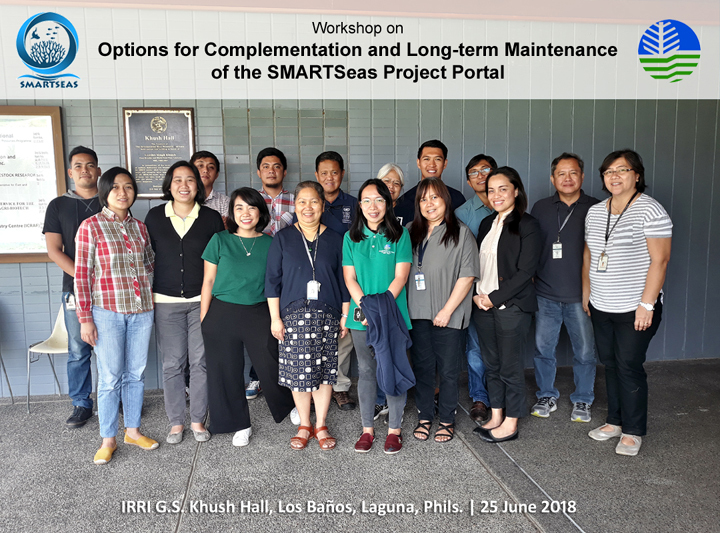 SMARTSeas PH Portal Workshop (June 2018) – Quantitative Aquatics, Inc.
During a consultation meeting with the SMARTSeas PH staff on 18 May 2018, various options to bring the accessibility and utilization of the SMARTSeas PH portal to the public and most importantly to the various agencies of the DENR – Biodiversity Management Bureau (BMB) to a new level, both for the benefit and maximization of the knowledge that has been phased into this product were discussed. To carry on initial discussions and design workable linkages between the portal and other databases operating in BMB, a one-day workshop was organized on 25 June 2018, primarily to draw options for complementation of these databases and create task-lines for the long-term maintenance of the project portal. Representatives from the Project Management Unit (PMU) of SMARTSeas PH, DENR – Biodiversity Management Bureau’s Coastal and Marine Division, BMB’s Planning Division and FishBase attended the “Options for Complementation and Long-term Maintenance of the SMARTSeas Project Portal” workshop which was held at the FishBase Headquarters in IRRI – Los Baños, Laguna, Philippines. The workshop programme can be viewed here. Click here to see list of participants. FISHBASE sends out an S.O.S. !